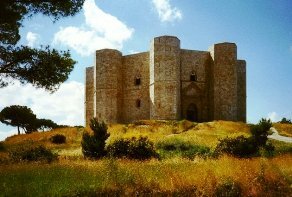 Dating back to a debated 1290, this castle in the Puglia region of southern Italy is an enigmatic construction which can be found in the area of Andria near the town of Santa Maria del Monte, on one of the modest peaks of the eastern Murge mountain range. 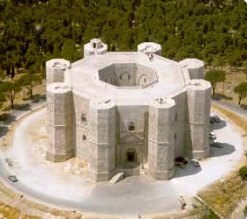 Given as a listed national building since 1936, and included on the list of heritage sites by UNESCO since some sixty years later, the Castel del Monte remains one of the treasures of Italian architecture. Its origins are uncertain, but scholars lean towards the theory that its creation was initiated by the then Emperor Federico II when he commanded Riccardo de Montefuscolo to make the necessary building materials available for a castle to be located near the by now disappeared church of Santa Maria de Monte. It is considered unlikely that Federico II lived to see its completion, but once again, no conclusive evidence of this is forthcoming. Historians maintain that it was used on occasion for ceremonies, including weddings, and also perhaps as a prison, but from the Seventeenth Century it fell into disuse and to a certain degree, disrepair, even to the extent that much of its furnishings were removed. In 1876 it was bought by the Italian State who set about its restoration three years later, a process which saw demolition of unstable portions of the walls. In spite of this, the efforts were unsuccessful and further restoration was needed, albeit it not happening for a further century. The octagon which comprises the main structure is highly symbolic, representing the union of the land, symbolised by the perfect square of the courtyard, and the infinity of the sky, seen in the form of a circle around it. An octagonal two storey building with a corresponding number of turrets, aligned in perfect sequence around the circumference, it is an example of extraordinary precision, but more interestingly, a building complete with a symbolism which has inspired many researchers. The interior plays host to numerous astrological symbols, and the main shadow observed at either of solstice or equinox is seen to adopt extremely precise dimensions in relation to the whole building. Twice a year (8 April and 8 October) the rays of the sun enter the internal courtyard via the southeasterly window to illuminate a section of the wall where could once be found a bas-relief, long since disappeared. Two lions flanking the southern access to the castle each look in a direction precisely at the horizon where the sun rises at each solstice, a particularity joined by the fact that the five water cisterns present under the towers connect perfectly to five fireplaces on the inside, with suggestions that this means the structure had functions as a temple. Scholars have added that inscriptions bear this theory out, but again, without a weight of evidence in support. 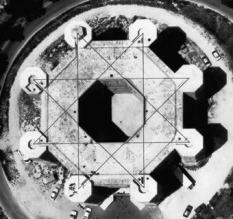 The Castel del Monte, an imposing presence on the Pugliese horizon, is not only octagonal architecturally, but inherently, with its eight vertical towers, eight internal rooms, eight four-leaved flowers on the left outer frame of the main entrance, and a similar number on the inner frame. Add to this eight leaves on the columns in the rooms, eight sunflower leaves on the key to one of the rooms, eight petals on the key to another room and eight fig leaves on the key to the eighth room, and the consistency points to a very deliberately and purposefully built castle, whose mystery remains today one of the great fascinations of the splendid Italian architecture that is rivalled by that of so few other countries.